The First Letter of John is the fourth of seven catholic or universal letters of the New Testament of the Bible, along with the James, the First and Second Letters of Peter, the Second and Third Letters of John, and Jude. These letters are so called because they are addressed to the universal Church in general, and not to a specific community, as, for example, the Philippians. 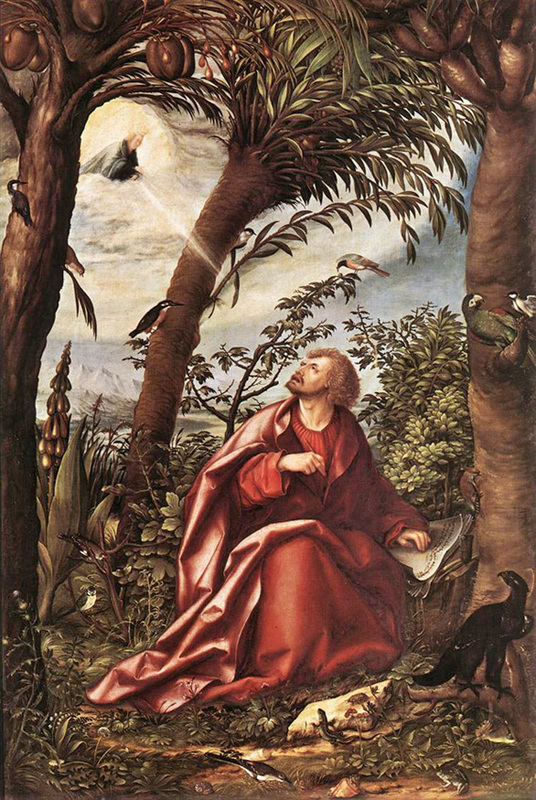 The First Letter of St. John is similar in style and content as the Gospel of John, and reaffirms the theme of the Divinity and humanity of Jesus Christ. Christ Jesus is the Son of God and the Saviour of the world (I John 4:14). It is thought that St. John wrote this in Ephesus in his elder years, although it is possible he wrote this while in exile on the island of Patmos. John reaffirms in his Gospel and this Letter that Jesus Christ is the Word (John 1:1 and I John 1:1), the only Son of God (John 1:18 and I John 4:9 and 4:14), and the Saviour of the world (John 4:42 and I John 4:14), and that Jesus has come in the flesh (John 1:14 and I John 4:2). The letter is of particular value for its development of the intrinsic connection between Christian belief and moral conduct: God is love, and the Christian who is a child of God has faith in Jesus Christ and loves his neighbor. This beautiful letter reassures us that God is Love (4:8 and 4:16). St. John wrote the Greek word ἀγάπη - agape for God's unconditional love. First John Chapter 4 helps one to "test the spirits to see whether they belong to God, for many false prophets have gone out into the world." 4:13-14 is a Trinitarian passage. The sharp contrast between good and evil is portrayed in John's favorite imagery of light and darkness. In addition to light/darkness, opposites common to John to elicit theological themes are present throughout his writings, such as truth/lies, love/hate, life/death, and righteousness/sin. Referring to the son of perdition in the Gospel of John 17:12, he calls him here for the first time the antichrist in First John 2:18, 2:22, and 4:3 and Second John 1:7, and explicitly names him in Revelation 12:9. The following Scripture is from the Douay-Rheims Bible now in the public domain and the New American Bible. Chapters 2-3 and 5 are from the Douay-Rheims Bible, and Chapters 1 and 4 are from the New American Bible. The Douay-Rheims Bible was the standard English Bible for Catholics for over 300 years, and still remains in use today. The Douay-Rheims Bible was the first approved English translation of St. Jerome's Latin Vulgate Bible. The Old Testament translation was completed at the English College of Douai, France in 1609, and the New Testament at the English College of Rheims, France in 1582. The Douay-Rheims Bible was revised by Bishop Challoner in England from 1749 to 1752. The Haydock Douay-Rheims Bible of 1814 was the one upon which President John F. Kennedy took the oath of office on January 20, 1961 to become the 35th President of the United States. The New American Bible is the most widely read Bible today by Catholics in the USA. Scripture texts taken from the New American Bible with Revised New Testament and Revised Psalms © 1991, 1986, 1970 Confraternity of Christian Doctrine, Washington, D.C. are used by permission of the copyright owner. All Rights Reserved. No part of the New American Bible may be reproduced in any form without permission in writing from the copyright owner. so that you too may have fellowship with us; for our fellowship is with the Father and with his Son, Jesus Christ. 6 If we say, "We have fellowship with him," while we continue to walk in darkness, we lie and do not act in truth. 7 But if we walk in the light as he is in the light, then we have fellowship with one another, and the blood of his Son Jesus cleanses us from all sin. 8 If we say, "We are without sin," we deceive ourselves, 3 and the truth is not in us. 9 If we acknowledge our sins, he is faithful and just and will forgive our sins and cleanse us from every wrongdoing. 10 If we say, "We have not sinned," we make him a liar, and his word is not in us. 1 My little children, these things I write to you, that you may not sin. But if any man sin, we have an advocate with the Father, Jesus Christ the just: 2 And he is the propitiation for our sins: and not for ours only, but also for those of the whole world. 3 And by this we know that we have known him, if we keep his commandments. 4 He who saith that he knoweth him, and keepeth not his commandments, is a liar, and the truth is not in him. 5 But he that keepeth his word, in him in very deed the charity of God is perfected; and by this we know that we are in him. 6 He that saith he abideth in him, ought himself also to walk, even as he walked. 7 Dearly beloved, I write not a new commandment to you, but an old commandment which you had from the beginning. The old commandment is the word which you have heard. 8 Again a new commandment I write unto you, which thing is true both in him and in you; because the darkness is passed, and the true light now shineth. 9 He that saith he is in the light, and hateth his brother, is in darkness even until now. 10 He that loveth his brother, abideth in the light, and there is no scandal in him. 11 But he that hateth his brother, is in darkness, and walketh in darkness, and knoweth not whither he goeth; because the darkness hath blinded his eyes. 12 I write unto you, little children, because your sins are forgiven you for his name's sake. 13 I write unto you, fathers, because you have known him, who is from the beginning. I write unto you, young men, because you have overcome the wicked one. 14 I write unto you, babes, because you have known the Father. I write unto you, young men, because you are strong, and the word of God abideth in you, and you have overcome the wicked one. 15 Love not the world, nor the things which are in the world. If any man love the world, the charity of the Father is not in him. 16 For all that is in the world, is the concupiscence of the flesh, and the concupiscence of the eyes, and the pride of life, which is not of the Father, but is of the world. 17 And the world passeth away, and the concupiscence thereof: but he that doth the will of God, abideth for ever. 18 Little children, it is the last hour; and as you have heard that Antichrist cometh, even now there are become many Antichrists: whereby we know that it is the last hour. 19 They went out from us, but they were not of us. For if they had been of us, they would no doubt have remained with us; but that they may be manifest, that they are not all of us. 20 But you have the unction from the Holy One, and know all things. 21 I have not written to you as to them that know not the truth, but as to them that know it: and that no lie is of the truth. 22 Who is a liar, but he who denieth that Jesus is the Christ? This is Antichrist, who denieth the Father, and the Son. 23 Whosoever denieth the Son, the same hath not the Father. He that confesseth the Son, hath the Father also. 24 As for you, let that which you have heard from the beginning, abide in you. If that abide in you, which you have heard from the beginning, you also shall abide in the Son, and in the Father. 25 And this is the promise which he hath promised us, life everlasting. 26 These things have I written to you, concerning them that seduce you. 27 And as for you, let the unction, which you have received from him, abide in you. And you have no need that any man teach you; but as his unction teacheth you of all things, and is truth, and is no lie. And as it hath taught you, abide in him. 28 And now, little children, abide in him, that when he shall appear, we may have confidence, and not be confounded by him at his coming. 29 If you know, that he is just, know ye, that every one also, who doth justice, is born of him. 1 Behold what manner of charity the Father hath bestowed upon us, that we should be called, and should be the sons of God. Therefore the world knoweth not us, because it knew not him. 2 Dearly beloved, we are now the sons of God; and it hath not yet appeared what we shall be. We know, that, when he shall appear, we shall be like to him: because we shall see him as he is. 3 And every one that hath this hope in him, sanctifieth himself, as he also is holy. 4 Whosoever committeth sin committeth also iniquity; and sin is iniquity. 5 And you know that he appeared to take away our sins, and in him there is no sin. 6 Whosoever abideth in him, sinneth not; and whosoever sinneth, hath not seen him, nor known him. 7 Little children, let no man deceive you. He that doth justice is just, even as he is just. 8 He that committeth sin is of the devil: for the devil sinneth from the beginning. For this purpose, the Son of God appeared, that he might destroy the works of the devil. 9 Whosoever is born of God, committeth not sin: for his seed abideth in him, and he can not sin, because he is born of God. 10 In this the children of God are manifest, and the children of the devil. Whosoever is not just, is not of God, nor he that loveth not his brother. 11 For this is the declaration, which you have heard from the beginning, that you should love one another. 12 Not as Cain, who was of the wicked one, and killed his brother. And wherefore did he kill him? Because his own works were wicked: and his brother's just. 13 Wonder not, brethren, if the world hate you. 14 We know that we have passed from death to life, because we love the brethren. He that loveth not, abideth in death. 15 Whosoever hateth his brother is a murderer. And you know that no murderer hath eternal life abiding in himself. 16 In this we have known the charity of God, because he hath laid down his life for us: and we ought to lay down our lives for the brethren. 17 He that hath the substance of this world, and shall see his brother in need, and shall shut up his compassion from him: how doth the charity of God abide in him? 18 My little children, let us not love in word, nor in tongue, but in deed, and in truth. 19 In this we know that we are of the truth: and in his sight shall persuade our hearts. 20 For if our heart reprehend us, God is greater than our heart, and knoweth all things. 21 Dearly beloved, if our heart do not reprehend us, we have confidence towards God: 22 And whatsoever we shall ask, we shall receive of him: because we keep his commandments, and do those things which are pleasing in his sight. 23 And this is his commandment, that we should believe in the name of his Son Jesus Christ: and love one another, as he hath given commandment unto us. 24 And he that keepeth his commandments, abideth in him, and he in him. And in this we know that he abideth in us, by the Spirit which he hath given us. 3 and every spirit that does not acknowledge Jesus does not belong to God. This is the spirit of the antichrist that, as you heard, is to come, but in fact is already in the world. 6 We belong to God, and anyone who knows God listens to us, while anyone who does not belong to God refuses to hear us. 7 Beloved, let us love one another, because love is of God; everyone who loves is begotten by God and knows God. 10 In this is love: not that we have loved God, but that he loved us and sent his Son as expiation for our sins. 11 Beloved, if God so loved us, we also must love one another. 12 No one has ever seen God. Yet, if we love one another, God remains in us, and his love is brought to perfection in us. 13 This is how we know that we remain in him and he in us, that he has given us of his Spirit. 14 Moreover, we have seen and testify that the Father sent his Son as savior of the world. 15 Whoever acknowledges that Jesus is the Son of God, God remains in him and he in God. 16 We have come to know and to believe in the love God has for us. 17 In this is love brought to perfection among us, that we have confidence on the day of judgment because as he is, so are we in this world. 18 There is no fear in love, but perfect love drives out fear because fear has to do with punishment, and so one who fears is not yet perfect in love. 19 We love because he first loved us. 20 If anyone says, "I love God," but hates his brother, he is a liar; for whoever does not love a brother whom he has seen cannot love God whom he has not seen. 21 This is the commandment we have from him: whoever loves God must also love his brother. 1 Whosoever believeth that Jesus is the Christ, is born of God. And every one that loveth him who begot, loveth him also who is born of him. 2 In this we know that we love the children of God: when we love God, and keep his commandments. 3 For this is the charity of God, that we keep his commandments: and his commandments are not heavy. 4 For whatsoever is born of God overcometh the world: and this is the victory which overcometh the world, our faith. 5 Who is he that overcometh the world, but he that believeth that Jesus is the Son of God? 6 This is he that came by water and blood, Jesus Christ: not by water only, but by water and blood. And it is the Spirit which testifieth, that Christ is the truth. 7 And there are three who give testimony in heaven, the Father, the Word, and the Holy Ghost. And these three are one. 8 And there are three that give testimony on earth: the spirit, and the water, and the blood: and these three are one. 9 If we receive the testimony of men, the testimony of God is greater. For this is the testimony of God, which is greater, because he hath testified of his Son. 10 He that believeth in the Son of God, hath the testimony of God in himself. He that believeth not the Son, maketh him a liar: because he believeth not in the testimony which God hath testified of his Son. 11 And this is the testimony, that God hath given to us eternal life. And this life is in his Son. 12 He that hath the Son, hath life. He that hath not the Son, hath not life. 13 These things I write to you, that you may know that you have eternal life, you who believe in the name of the Son of God. 14 And this is the confidence which we have towards him: That, whatsoever we shall ask according to his will, he heareth us. 15 And we know that he heareth us whatsoever we ask: we know that we have the petitions which we request of him. 16 He that knoweth his brother to sin a sin which is not to death, let him ask, and life shall be given to him, who sinneth not to death. There is a sin unto death: for that I say not that any man ask. 17 All iniquity is sin. And there is a sin unto death. 18 We know that no one begotten by God sins; but the one begotten by God he protects, and the evil one cannot touch him. 19 We know that we belong to God, and the whole world is under the power of the evil one. 20 We also know that the Son of God has come and has given us discernment to know the one who is true. And we are in the one who is true, in his Son Jesus Christ. He is the true God and eternal life.